North Block, New Delhi – 110 001.
does not allow the employees to withdraw enough money from their own pension fund to meet the medical emergencies. Leaves the employees at the mercy of volatile markets and the forces that have notoriously been manipulating the markets. 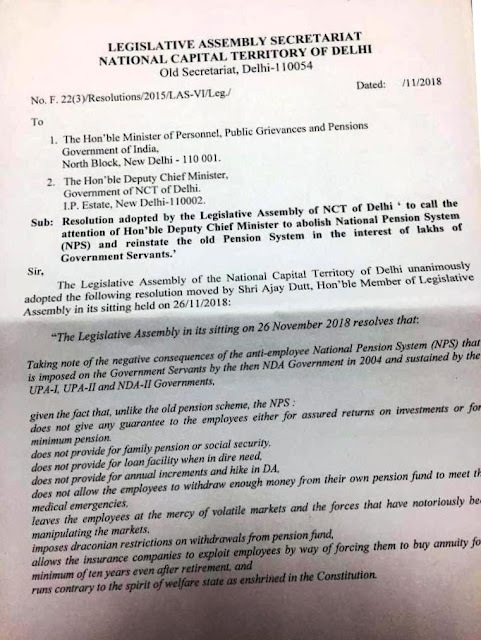 Given the fact that the pra- people and welfare oriented Government of NCT of Delhi is strongly in favour of restoring the rights and privileges of its employees by way of replacing the NPS with the time tested old Pension Scheme. 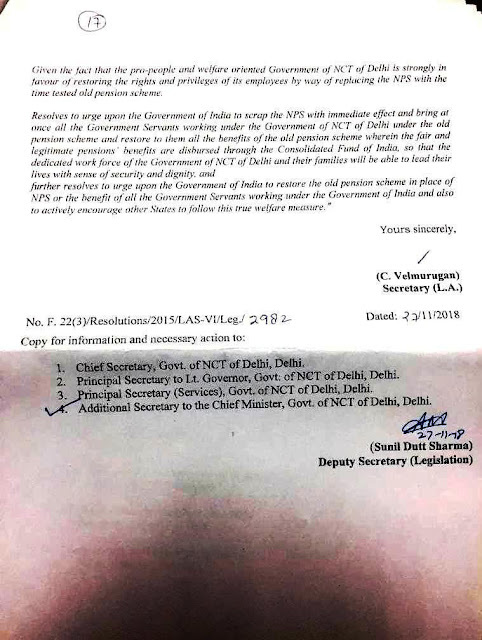 Resolves to urge upon the Government of India to scrap the NPS with immediate effect and bring at once all the Government Servants working under the Government of NCT of Delhi under the Old Pension Scheme and restore to them all the benefits of the old pension scheme wherein the fair and legitimate pensions benefits are disbursed through the consolidated fund of india, so that the dedicated work force of the Government of NCT of Delhi and their families will be able to lead their lives with sense of security and dignity and further resolves to urge upon the Government of India to restore the old pension scheme in place of NPS or the benefit of all the Government Servants working under the Government of India and also to actively encourage other states to follow this true welfare measure”.